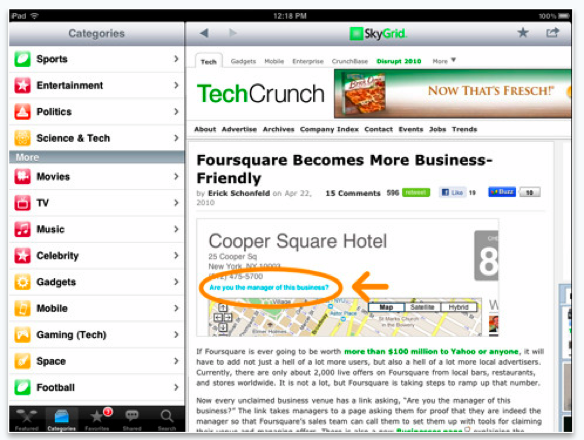 SkyGrid, which offers a powerful business news aggregator, has developed a compelling iPad app that makes accessing realtime news content simple. You can download the free app here. SkyGrid’s app aims to filter the news, with the aim of giving you the most important news right as it’s happening. SkyGrid’s app knows what’s the most important because it looks at the people, topics, and events, that are spreading the fastest around the whole world. The startup’s patented algorithm, Information Velocity, measures what news is spreading the fastest across the world, and brings that content directly to you. The app streams information from mainstream news, social sites, and blogs and allows you to share news articles and streams on the app via email, Twitter and Facebook. And SkyGrid allows you to filter news by type, with news centralized around politics, tech, sports, entertainment, healthcare and more. The app also lets you create custom streams that combine different types of news. Of course, the nature of the iPad as a media consumption device makes the app particularly useful for catching up on relevant news, that’s updated in realtime. And while SkyGrid originated aggregating news about public companies only, the app has opened up its content to include all companies and startups.